A photo from a Chinese aerospace exhibit, posted on an Internet forum, provides the first new evidence in more than six months regarding the role and capabilities of China’s first stealth fighter prototype. 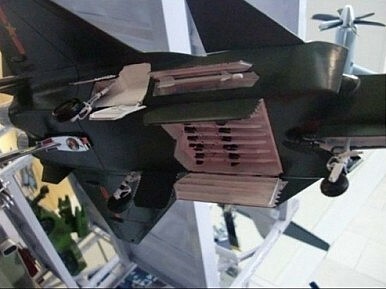 The photo depicts the underside of a scale model of the Chengdu J-20, showing the angular fighter’s three weapons bays open and eight air-to-air missiles mounted inside. The missile loud-out includes one short-range infrared-guided missile in each of two small side bays, plus six medium-range missiles packed into the single, large, belly bay. Since shortly after the J-20 made its public debut on Christmas Day, the consensus among Western observers has been that the new fighter is optimized for air-to-ground attacks against heavily defended targets. That belief stems from the J-20’s apparent large size: up to 70 feet long and 40 tonnes fully loaded, compared to 62 feet and 32 tonnes for the US F-22 stealth fighter. The J-20’s basic dimensions most closely match the F-111 bomber retired from service in the late 1990s. Beijing’s emphasis on pre-emptive military doctrine seemed to support the J-20-as-bomber theory. Many of China’s most impressive weapons developments in recent years, including the long-range ballistic missiles of the Second Artillery Corps plus surveillance satellites, have been driven by the People’s Liberation Army’s ‘Joint Anti-Air Raid Campaign’ doctrine. ‘The Joint Anti-Air Raid Campaign is designed as the cornerstone for countering US military intervention and draws heavily on PLA observations of US war-fighting tendencies as demonstrated in numerous conflicts including the 1991 Gulf War and 1999 Operation Allied Force,’ Wayne Ulman wrote in Chinese Aerospace Power, a new collection of essays edited by noted China analyst Andrew Erickson. In part, the doctrine aims to disable most US airfields and aircraft carriers in the western Pacific before they launch aircraft to intervene in any Chinese military operation. The missiles and satellites are key components of that offensive capability—and the J-20 was previously thought to be so as well. A fast, long-range, stealthy, precision bomber might be able to penetrate US defences and destroy any airfield infrastructure that survived the missile barrage. But the scale model of the J-20, if accurate, undermines this conclusion. ‘It is hard to judge definitively from this photo of a scale model, but there doesn’t appear to be room for air-to-surface missiles like the bulky YJ-12 or smart bombs inside the internal bays,’ aviation journalist Stephen Trimble wrote on his blog. Instead, the J-20 appears solely configured for an air-to-air weapons load—in fact, a load that matches the F-22's arsenal of two short- and six medium-range air-to-air missiles. But if the J-20 is strictly an interceptor, what kind of interceptor will it be—and how might the People’s Liberation Army Air Force employ it in future conflicts? Ask the Russians. Throughout the Cold War, Moscow invested heavily in large, fast interceptors meant to destroy American bombers flying over Siberia. In their day, the MiG-25 (65 feet long, 40 tonnes) and MiG-31 (75 feet, 45 tonnes) were both widely feared by NATO. But when the prospect of World War III faded, so did the interceptors’ utility, and Moscow has chosen not to continue their development. But the Chinese Communist Party views the world differently. An interceptor J-20 might still figure in the Joint Anti-Air Raid Campaign, though in a different role than previously thought. After all, the doctrine ‘has both defensive and offensive components,’ Ulman pointed out. In the event of major war, the PLAAF would need to defend its own airfields and installations against any US warplanes that survived the initial Chinese onslaught. In fact, Washington is working to remove the bulk of its air power from within the range of Chinese missiles and warplanes, possibly heightening Beijing's need for an interceptor. The new ‘B-3’ stealth bomber, under development for the US Air Force, would reinforce the current American bomber presence on Guam in around a decade’s time. ‘The PLAAF and Second Artillery Corps currently have only limited capabilities to threaten US facilities on Guam due to their distance from mainland China,’ Ulman wrote. As more US aircraft concentrate on Guam, the PLAAF might need to counter with an improved capability to intercept them en route to their targets. The J-20 could possibly meet this need. Of course, the destruction of stealthy bombers doesn’t necessarily require a stealthy interceptor like the J-20. The J-20's ability to evade detection—a consequence of its airframe shape, above all else—doesn’t really improve its own ability to detect a B-3 or another US stealth plane. But the J-20 could help the PLAAF develop other methods of countering stealthy planes. ‘As the PLAAF gains access to reduced-signature systems, it will allow the development of tactics, training, and procedures for use against low-observable threat systems,’ Ulman posited. In that case, it hardly matters what role the J-20 actually performs if and when it enters full-scale military service. All that matters is that it helps the PLAAF understand stealth technology, so Beijing can develop systems specifically tailored to defeat it. If the J-20 also performs as a useful interceptor in its own right, helping defend against incoming US bombers during some hypothetical shooting war—well, that’s just a nice bonus. Hype over the J-20 stealth fighter shouldn’t overlook it will be a smaller force than the US F-22 and F-35 fleet. Oxygen Problems Hit F-22China's Jump Jet MysteryNew US Bomber Aimed at China?Pentagon Turns Eyes Toward AsiaAt What Cost Stealth?